* Each chapter includes four components: an excerpt from the ethnographic study; an analytic commentary on the ethnographic text drawn from a variety of theoretical perspectives and academic disciplines (including interactionist sociolinguistics, language minority education, English as a Second Language education, critical literacy, anti-racist education, and critical teacher education); a pedagogical discussion; and suggestions for further reflection and discussion. * The book features the use of ethnographic play writing to engage readers with the issues that arise in multicultural/multilingual schools. The author's play Hong Kong, Canada is included in its entirety and is used to stimulate further discussion of the issues raised in each of the chapters. * Although it is organized around two different kinds of schooling dilemmas--dilemmas of speech and silence, and dilemmas of discrimination--everyday dilemmas of curriculum and assessment are also discussed throughout the book. * A methodological discussion of the choices the author made while designing, conducting, and writing up the critical ethnographic case study makes the book useful in qualitative research methodology courses. * A set of strategies and activities is provided for helping students develop English oral presentation skills. "Tara Goldstein, a critical ethnographer and teacher educator, deserves to be congratulated for her new book….Rarely do we find such a successful integration of ethnographic research data, critical theoretical analysis, and practical pedagogical suggestions in a single volume as this one….This book is a must-read for mainstream teachers, ESL/ESOL teachers as well as teacher educators, critical education theorists, critical applied linguists, and anyone who has an interest in anti-racist and inclusive education." "The variety of perspectives on teaching and learning in a Canadian multilingual, multicultural high school presents an opportunity to reflect on personal beliefs and practices applied in any school setting….Highly recommended." "Goldstein advances a position which promotes both multilingual and explicit English-learning activities in the classroom - a position which takes account of the fact that speaking and using a new language is not just about target language acquisition, but also about identity negotiation and social networks. Dealing with this complexity in classrooms is never going to be easy, but 'Teaching and Learning in a Multilingual School' gives us more than food for thought. It deserves a wide reading by teachers, students and the wider academic community." "The book is unique in the way it draws upon playwriting and play performance…as well as critical ethnographic methods and teacher education practices. 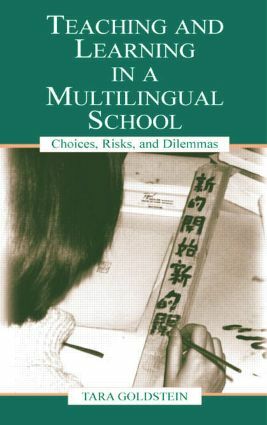 Goldstein's work makes a strong contribution to educational research theory, multicultural education theory, and multilingualism, while providing a text that is grounded in practice and useful for practitioners in the field….presents multiple perspectives on the complex issue of teaching and learning in multilingual contexts as ways to draw the reader into the tension produced by critical educational dilemmas." "In weaving together theory and practice, Teaching and Learning in a Multilingual School is a rich resource for all educators. Tara Goldstein and her research assistants, contributors, and informants from Northside have provided us with an invaluable, insiders' view whose broader pedagogical relevance is assured." "Readers should not miss the methods appendix, where Goldstein offers behind-the-scenes discussion about the research team, ethical issues faced in the study, and the playwriting process….Goldstein accomplishes her objectives for this hybrid critical teacher education text means that the book has many strengths. It is interesting and theoretically complex, and the voices of the informants are clear. The excellent critical pedagogy strategies and techniques Goldstein suggests are applicable to classrooms in a variety of settings, particularly in teacher education." "The combination of insights from ethnography with suggestions for teachers is excellent….My hope would be that a book such as this could somehow be made required reading for all school personnel….I get excited just thinking about the possibility of working with a teacher study/research group using this book as a jumping-off point!" "Through a critical ethnography, including the stories and performance pieces of teachers and students, Tara Goldstein presents a portrait of the search for identity and struggle for understanding in a multilingual school….The use of theater, and dramatic representation of the struggle of immigrant students and their teachers, is particularly intriguing." Contents: S. Nieto, Series Editor Foreword. Contents: Preface. Introduction: Bilingual Life and Language Choice of Northside. Part I: Dilemmas of Speech and Silence. Accepting and Legitimizing Multilingualism. Promoting and Legitimizing English. Responding to Silence. Part II: Dilemmas of Discrimination. Resisting Anti-Immigrant Discourses and Linguicism. Oral Presentations, Accent Discrimination and Linguistic Privilege. Conclusion: Challenging Linguistic Inequities in Multilingual School Communities. Appendices: Hong Kong, Canada. Critical Educational Ethnography in Postmodern Times. J. Ngan, Developing Oral Presentation Skills.